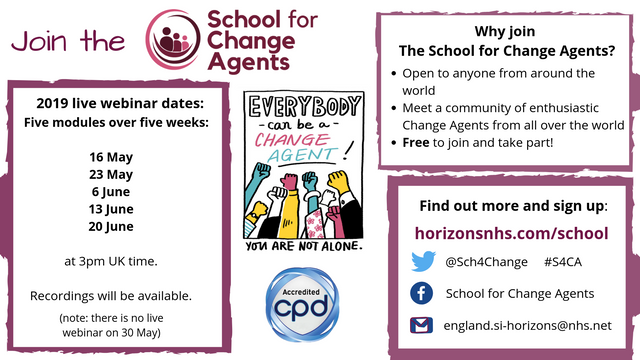 The School for Change Agents builds change agency which is the power, individually and collectively, to make a difference. It is about pushing the boundaries of what is possible, mobilising others and making change happen more quickly. We are more than a school. We are a movement of 15,000 people in the health sector building a community to create the boldest and most innovative new ideas in health and care. It is the most widely used skill-building programme for change in the NHS. The Community is entirely online, there are five interactive live webinars with the opportunity to catch up with the recordings afterwards. The School will provide you with the skills, confidence and community to make a difference in an ever-changing and evolving environment, and the skills to implement the NHS Long Term Plan through sharing the latest in change and transformation thinking. You will leave the School with the power to make change in your organisation. We're looking forward to seeing you there! Sign up now. You can also read testimonials from people who have previously taken the course, as well as frequently asked questions. You can find the School community on Facebook, and on Twitter.